It’s time for another exciting and fun filled adventure. ✔ Camping on the grounds of the Waterfall. ✔ Hiking to the first level of the waterfall. ✔ Explore the forest magnificent sculptures, effigies, carvings and awe-inspiring shrines. ✔ Experience a serene environment and peaceful nature. ✔ Pictures with sculptures and carvings. Departure From Ogbomosho and Ilorin. 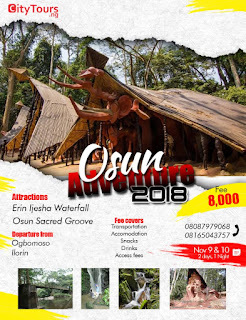 You can also check the WhatsApp link below to Join other Tourists.